More than 500 athletes gathered at Donner Lake over the weekend for two days of competition with Big Blue Adventure hosting the annual Donner Lake Triathlon. 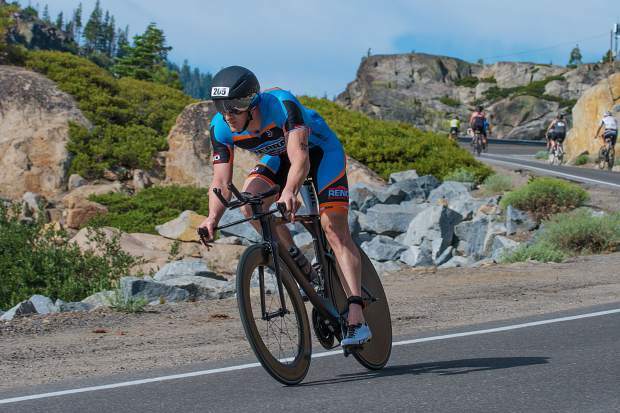 The races were based out of Donner Lake’s West End Beach and began on Saturday, July 22, with the Triathlon Sprint and Kids Triathlon, which was then followed by Sunday’s Half Iron 70.3 Triathlon and Olympic Triathlon. The Olympic Triathlon drew 241 competitors with Justin Rossi from Reno using his background in swimming and cycling to take the overall win. Rossi was the first athlete out of the water, finishing the 1,500-meter lap in Donner Lake over a minute ahead of the nearest competitor with a time of 19 minutes, 52 seconds. Rossi then transitioned to his strongest discipline in cycling, as he extended his lead by finishing the 40-kilometer course over 4 minutes faster than any competitor with a time of 1 hour, 8 minutes, 18 seconds. Verdi’s Zach Yeager would carve into Rossi’s lead — finishing over 5 minutes faster during the 6.5-mile run — but it wouldn’t be enough as Rossi held on to win the race with a time of 2:17:19. Yeager finished with a time of 2:22:13. On the women’s side, Isabel King out of San Francisco won the women’s division while competing in her first triathlon. King was the seventh female out of the water, but tracked down her competitors with the fastest time on the bike to move up into third place. King then passed the remaining women during the run, finishing with a time of 46:01 for the fastest time of any of the women. The weekend’s longest race, the Half Iron 70.3-mile Triathlon also was held on Sunday, July 23, where Stephen O’Mara out of San Rafael, Calif., came from six places back to defeat a field of 53 competitors with a time of 4:47:17. The race for second place would be close with Kevin Weil out of Portola Valley, Calif., edging out Truckee’s Donatas Ereminas by just under three minutes with a time of 5:03:07. On the women’s side, Danielle Widenmann out of Vacaville won the race with a time of 5:28:35. Truckee’s Raeleigh Harris was second with a time of 5:32:38. Harris was the only woman to break the 3-hour mark on the bike, but Widenmann outpaced her on the run by nearly 10 minutes to capture the win. The weekend also included children’s races and a shorter Sprint Race. Local winners included Truckee’s Sawyer Huen, who won the female 6-and-under division, Tatum Akers of Truckee from the 11-12 girls’ age group, Salomon McMahan of Incline Village from the boys’ 7-8 age group, and Levi Boyd of Tahoe City in the boys’ 9-10 age division.